I will admit that I hadn't been very impressed with the work of Frank J. Barbiere up to this point. It's not that I thought he was a bad writer, it's just that nothing that I'd read by him had really clicked for me, and I was pretty indifferent to seeing his name on a project. 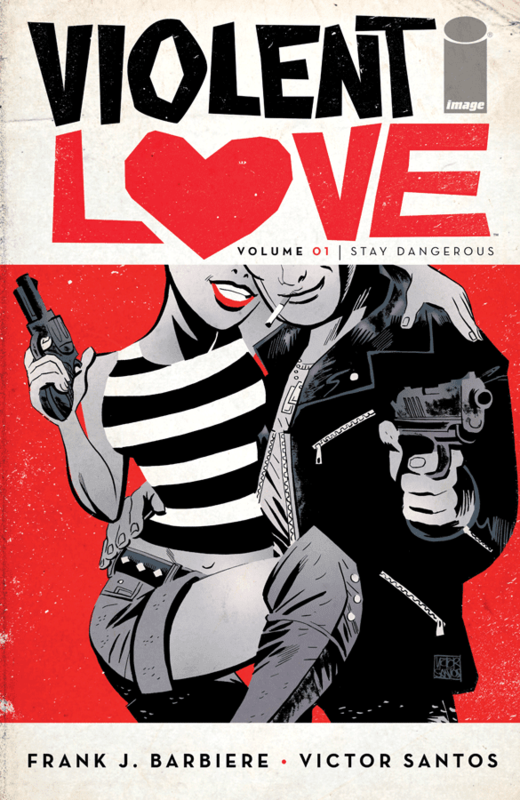 I do like Victor Santos's art though, so when I saw that their Violent Love began with a $10 trade, I felt that it would be a good idea to get it. The book begins with a framing sequence that has a retired US marshal watching a young girl for her mother. The girl shows interest in one particular case of the marshal's, that of Daisy Jane and Rock Bradley, a kind of Mickey and Mallory of the early 1970s. The girl gets the man to tell the story, and it's at this point that Barbiere started to play with my expectations. I think I expected a pretty straightforward romance and crime story, and found it interesting when the male part of this pairing barely appears in the first half of this trade, and doesn't really show much character until the very end of it. Daisy is the real star of this book, and we learn what has led her to a life of using crime to fund a mission of vengeance. She is with another man when she first meets Rock, while she hunts for the guy who ruined her life. This mission leads to a bloody conflict with La Jauria, a cartel that employs some very colourful assassins. Santos is great at both character work and at portraying some pretty mayhem-filled violent scenes. I never really grew to like Daisy all that much, and found the revelation that closed off the book to be a little predictable (if probably difficult to explain), but I was completely drawn in by the plot, and now want to get the rest of this series so I can see how it all ends.